Expression and validation of detoxification pathway genes. 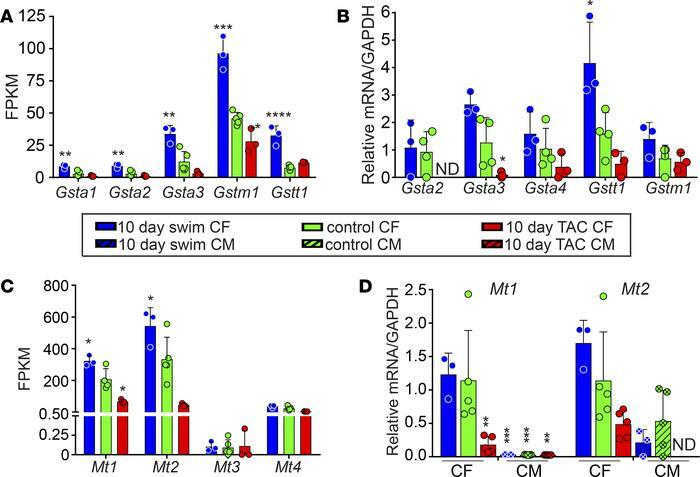 FPKM values (A and C) and qPCR validation of RNA-Seq data from C57BL/6 animals (B and D) for genes encoding GST family proteins (A and B) or MT family proteins (C and D) in mouse CFs and CMs after 10-day swim and 10-day TAC, compared with controls. Statistics were performed using 1-way ANOVA and Tukey’s post-hoc test (n = 3 except for control where n = 5). *P < 0.05, **P < 0.01, ***P < 0.001, ****P < 0.0001.